Between 1892 and 1954, more than twelve million immigrants passed through the U.S. immigration portal at Ellis Island, enshrining it as an icon of America's welcome. That story is well known. But Ellis was also a place of detainment and deportation, an often-heartbreaking counterpoint to the joy and relief of coming to America. "The New World's 'Golden Door' was, for some, a place of protracted anguish. While the immigration service efficiently channeled millions through Ellis Island's Main Building, countless others awaited their fates in the hospital and infectious disease wards on the south side of the island. Some recuperated sufficiently to enter America, but others were returned to their homelands." Many thousands of immigrants came to know Ellis Island as "detained petitioners to the New World." These determined individuals had crossed oceans, under the burden of fear and persecution, famine and numbing poverty, to make a new life in America. For some, the story ended happily; for others, in prolonged uncertainty about which way the "Golden Door" would swing. New arrivals were processed quickly. In the Registry Room, Public Health Service doctors looked to see if any of them wheezed, coughed, shuffled or limped. Children were asked their names to make sure they weren't deaf or dumb. Toddlers were taken from their mothers' arms and made to walk. As the line moved forward, doctors had only a few seconds to check each immigrant for sixty symptoms of disease. Of primary concern were cholera, favus (scalp and nail fungus), tuberculosis, insanity, epilepsy, and mental impairments. The disease most feared was trachoma, a highly contagious eye infection that could lead to blindness and death. 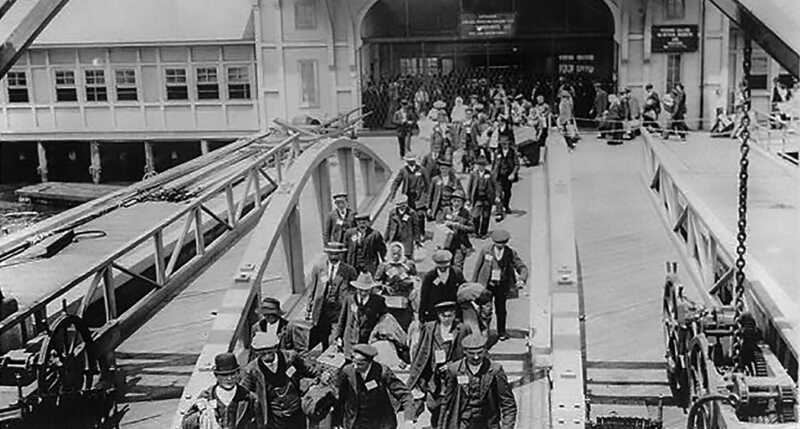 Once registered, immigrants were free to enter the New World and start their new lives. But if they were sick, they spent days, weeks, months even, in a warren of rooms. Some, like the tuberculosis ward, were open to the sea, where a gentle New York harbor breeze cleansed their lungs, improving their chances. Other rooms were solitary, forlorn places where the illness itself decided when to leave or stay. Most patients in the hospital or Contagious Disease Ward recovered, but some were not so lucky. More than 120,000 immigrants were sent back to their countries of origin, and during the island's half-century of operation more than 3,500 immigrants died there. Ellis Island waylaid certain arrivals, including those likely to become public charges, such as unescorted women and children. Women could not leave Ellis Island with a man not related to them. Other detainees included stowaways, alien seamen, anarchists, Bolsheviks, criminals and those judged to be "immoral." Approximately 20 percent of immigrants inspected at Ellis Island were temporarily detained, half for health reasons and half for legal reasons. When America entered World War I in April 1917, anti-immigration sentiment peaked. People in favor of restricting immigration judged the newcomers racially inferior, and warned of the danger of allowing a "melting pot" made up of an impoverished, criminal, radical and diseased horde. "To Ye Aged and Beloved, Mr. John Higginson, There be now at sea a ship called Welcome, which has on board one hundred or more of the heretics and malignants called Quakers, with W. Penn... at the head of them. The General Court has accordingly given secret orders to Master Malachi Huscott, of the brig Porpoise, to waylay the said Welcome slyly as near the Cape of Cod as may be, and make captive the said Penn and his ungodly crew, so that the Lord may be glorified and not mocked on the soil of this new country with the heathen worship of these people. Much spoil can be made by selling the whole lot to Barbados, where slaves fetch good prices in rum and sugar, and we shall not only do the Lord great service by punishing the wicked, but we shall make great good for His Minister and people, Yours in the bowels of Christ, Cotton Mather." 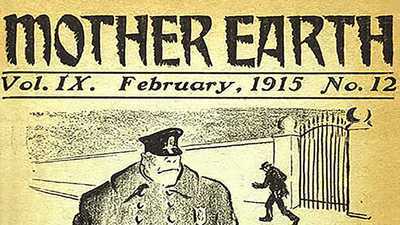 In the nativist years of the nineteen-teens and twenties, labor strikes, occasional violence (such as the bombing of the Preparedness Parade in San Francisco in 1916), and war opposition prompted the Department of Justice to arrest hundreds of aliens suspected of communist or anarchist sympathies. Soon, Ellis Island's role changed from immigrant depot to detention center. In 1919, as a wave of anti-immigration hysteria swept the country, Frederic C. Howe, Commissioner of the Immigration Service, wrote despondently, "I have become a jailer." "The whole nation seemed to become a frantic mob," wrote another Immigration Service official. 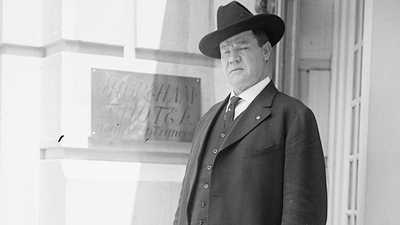 "It is apparently possible for an agent of the Department [of Justice] to enter a man's house, arrest him, [and take him] to Ellis Island, thence to be sent to the country of his birth because of his political opinions." Continuing the government's exclusionary policies, President Warren G. Harding signed into law the first Quota Act (1921). This law effectively ended America's open-door policy by setting monthly quotas, limiting admission of each nationality to three percent of its representation in the 1910 Census. Further restrictions followed, such as the National Origins Act, which allowed prospective immigrants to be examined in their country of origin, and often refused before making the trip to Ellis Island. Soon after the new law went into effect, Ellis Island "looked like a deserted village," commented one official. By the 1930s, Ellis Island was used almost exclusively for detention and deportation. During World War II, as many as 7,000 detainees and "internees" were held at the Island. Under the Geneva Conventions, war prisoners were permitted to have an advocate speak for them. These representatives sometimes gained significant concessions at Ellis Island. Nazi prisoners, for example, were allowed to celebrate Adolf Hitler's birthday each year. In 1954, after 62 years of operation, Ellis Island was closed by the Immigration and Naturalization Service. For ten years, the Main Building stood vacant. Vandals made off with anything they could carry, from doorknobs to filing cabinets. Snow swirled through broken windows, roofs leaked, weeds sprang up in corridors, and interior walls soaked up harbor moisture like sponges. In 1965, Ellis Island became part of the Statue of Liberty National Monument, overseen by the National Park Service. Nearly thirty years later, in 1990, the Main Building was fully restored and opened as the Immigration Museum. Thirty other buildings, including the Baggage and Dormitory Building, the Hospital, and the Contagious Disease Ward, continued to deteriorate. Today, a non-profit organization, aptly named Save Ellis Island!, is working to preserve these unsung structures. Through their efforts, and those of the National Park Service, the history of all thirty-three buildings that make up Ellis Island -- and that of the humanity that was processed, given medical attention, and detained within their walls -- will be told. 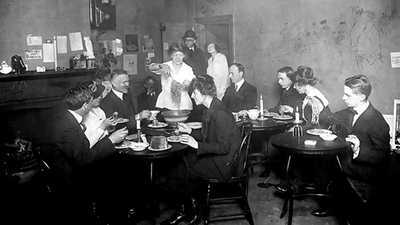 At the turn of the twentieth century, the idea of an organization that could represent all workers came to life. Emma Goldman was arrested often and harassed innumerable times.